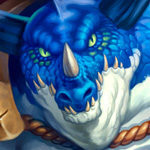 Even Shaman is a powerful midrange list that continues to be a great choice for the class going into the Rastakhan’s Rumble expansion. We go through the card choices, mulligans, strategies, and available card substitutions in our Even Shaman guide! For the last few expansions, Shaman was near the bottom when it comes to the class performance. However, ever since Witchwood has dropped, there’s one deck that keeps finding its way into the meta – Even Shaman. The deck’s very interesting, because statistics always put it into a higher tier, but it doesn’t see a lot of play in practice. Murkspark Eel is a great card, there’s no doubt about it. Would you like to destroy your opponent’s two-drop and develop a well-statted two-drop at the same time? Does that sound like a nice swing to get the game started? It does, it does. The power of Murkspark Eel comes at a cost, however, as you need to run a deck that consists of only even-cost cards (0, 2, 4, 6, and so on), and when you go there, you obviously want to include Genn Greymane as well for a cheaper Hero Power. From these humble beginnings, Even Shaman was born. It is a board-centric midrange deck that uses buffs to make use of the Totem boards it is able to build, and also makes good use of keywords such as Charge, Rush and Windfury to get even more value from its buffs. It is ready to fight for the board against any other deck and can deliver a lot of damage quickly if left uncontested. Find more versions of this deck type on our Even Shaman archetype page! The entire deck revolves around Murkspark Eel and the cheap Hero Power from Genn Greymane. All the card choices are based on ways to build synergies around tokens and an early swing turn. So, how are these synergies built? Earthen Might – It’s a single target buff and theoretically works better when played on Elementals, but turning your 0/2 Totem into a 2/4 minion on Turn 2 can win some games. 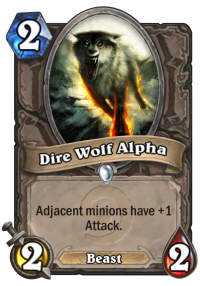 Dire Wolf Alpha can help small tokens trade away big minions by running a chain of them into a big minion, getting the buff for each minion in turn. Al'Akir the Windlord – Trades and potential lethal – Al'Akir the Windlord when combined with Earthen Might can deal 10 damage, and both can be played on the same turn for 10 mana. As this package comes with Lifesteal, Divine Shield, and Windfury, it is an easy step to add Corpsetaker to the deck – yet another synergy with many of the cards in the deck, including the buff cards. The deck also runs a small Elemental package – Menacing Nimbus, Fire Elemental, Al'Akir the Windlord and Kalimos, Primal Lord. The package is there mostly to activate Kalimos, as well as take advantage of the secondary effect of Earthen Might. Plated Beetle – A solid 2-drop, gives the deck some life gain. Hex – Tech card. Better than Silence. The Lich King – A power play at the top of the curve. Anti-Magic Shell is sweet with tokens, if you happen to find that. You need to take board control early on, and your mulligan decisions need to reflect that. Against aggressive decks, you look for everything that gives you a board, whereas against slow decks you balance between early minions and major threats. Murkspark Eel – The ultimate early board-control tool. Dire Wolf Alpha – Activate your Totems into useful minions. Earthen Might – Turn that T1 Totem into something useful and start controling the board early. Primalfin Totem – Solid 2-drop, it can get lots of value if you can protect it. The problem is that you can’t always protect it, so you prefer to have another 2-drop and play Primalfin Totem on T3 with Hero Power. Knife Juggler – Juggler is great if you can stick it, but the 2/2 body makes it a bit difficult. Just like Primalfin Totem, it’s better with another 2-drop, so you can play it on T3 with Hero Power. Sea Giant – You will be playing lots of minions, and your opponent will be playing lots of minions. Even though you will usually be trading, there WILL be some turns in which multiple minions are on the board at once. Getting it down to 3-4 mana is doable, but even at 5 mana it’s good. Corpsetaker – Good keep if you have two 2-drops already to cover your Turn 2 and Turn 3. Primalfin Totem – Solid card to drop on the curve, since slower decks don’t have many early game minions, it might pump out a few 1/1’s before it gets removed. Knife Juggler – If it sticks, it can get a lot of value over multiple turns. Even if it hits face, getting +1 damage every time you summon a minion is big. Earthen Might – Turn your Totem into a solid minion on T2, start getting the early damage in. Dire Wolf Alpha – Worse than Flametongue Totem, but since it can’t be played in Even Shaman after nerfs, you have no choice. With two other minions, it adds 4 damage onto the board, possibly even more if you end up trading. Menacing Nimbus – Worse than the other 2-drops, but if you don’t have anything else, you can keep it. Corpsetaker – The biggest early-game threat in the deck. It’s hard to answer because of the Divine Shield, and it can pack a serious punch, especially if you buff it. Sea Giant – Since you should be able to stack some minions early, you will often be able to play Sea Giant around T5 or T6, and that’s a really big body that your opponent has to remove. Hex – Keep against Warlock – Cube and Even Warlocks can drop very early Mountain Giant (or Twilight Drake in case of Even). Even Shaman is a board-centric midrange deck. It does not have a very aggressive start, but buffs and Corpsetaker allow it to ramp up damage very quickly a few turns into the game. Your turn one is most of the time Hero Power, sometimes Coin two-drop if you have a good curve in hand, such as Primalfin Totem into Dire Wolf Alpha. This specific build runs no Overload cards, which means that you don’t have to plan your turns ahead around that. You can still get some Overload cards from Hagatha the Witch, but overload isn’t very problematic so late into the game anyway. With so many positional cards in the deck, positioning is crucial for Even Shaman, reminiscent of old Zoolock decks. Think carefully which minions you want to be affected by buffs, and where you can set up a chain of minions that can trade into a bigger minion with a buff, each one getting destroyed and next one getting the buff in turn. Play your big minions on the side, preferably on the left, because Hero Power totems appear on the right. Try to set the buff-givers near the middle so that there are usable minions on both sides of them. Aggro decks are generally faster than you, as it takes you a couple of turns to get going and your damage is reliant on a couple of big minions and buff-givers – which can easily be destroyed if you try to go for a race. 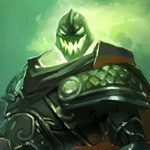 Therefore, you take on the control role in the matchup, remove their threats and gradually build up your own. Since the deck runs no early or mid game AoE removals (both Lightning Storm and Volcano are odd-costed), you want to be as proactive as possible. Try to not fall behind and play for the tempo. Falling behind early is the easiest way to lose those matchups, so try to capitalize on your totems as well as you can – with cards such as Earthen Might or Dire Wolf Alpha. Don’t worry about using Earthen Might on a non-Elemental minion, the buff part is much more important in fast matchups. The deck runs some minions with single target damage on Battlecry – Murkspark Eel and Fire Elemental to be specific. Use those to clear key minions, such as Knife Juggler or Vicious Fledgling, so it will be easier to take back control. Similarly, utilize Rush and Charge minions to control the board. Vicious Scalehide is an good card vs Aggro if you can buff it. For example, Turn 4 Scalehide + Earthen Might creates a 3/5 minion with Rush and Lifesteal. Not only you can clear something immediately, but you will also be able to heal nicely. Even Knife Juggler can be really powerful in the mid/late game, once you can play it alongside a few other minions. While the knives are RNG, there is a high chance that some will land on your opponent’s minions, helping you clear them. You have two 4 mana Taunts, and each one of them is better in different scenario. Saronite Chain Gang is better against multiple small tokens, since it has 6 health in total and is spread over two bodies. Corpsetaker on the other hand is better against 2-drops and 3-drops, especially those with 3 health, e.g. 2/3 or 3/3. If your opponent has no way to get rid of the Divine Shield (such as a small minion), you might get a nice two for one while healing at the same time. If you get to the late game, both Hagatha the Witch and Kalimos, Primal Lord can help you stabilize with the 3 AoE damage. Both can also be used to gain some health – 5 Armor in case of Hagatha and 12 health in case of Kalimos. However, keep in mind that those cost 8 mana, so they come really late into the game – you’d be dead far before that point if you relied solely on them to get the board control back. Since your AoE is very limited, you need another way to take advantage of the fact that your opponent might drop a lot of minions – and that way is Sea Giant. It gets cheaper for every minion on the board, possibly down to 0, although that doesn’t come up often. Still, even at 3 or 4 mana, you put a massive body on the board, and given that Aggro decks generally don’t run big removals, you will be able to pressure their health total or trade a lot. Usually, it’s better to go for the safe route, as you will outvalue most of the faster decks anyway. Of course, do it efficiently – you can trade a 3/3 that will threaten your life total, but don’t run your Giant into a 1/2 minion, for example, unless you absolutely need to. Also, with this deck, after you turn into Hagatha, no game is really lost. You can always get some great mix of random spells that will help you come back. I won some games by getting 2x Healing Rain in a row vs a Tempo Mage that was just about to kill me, so it can happen. Against Control decks, there are two basic approaches you can take. Or rather, you always try to take the first one, and if it fails, take the second one. The first approach is obviously aggression. No, this deck is not an Aggro build, but as a Midrange deck, you still play beatdown vs Control. In that case, first you try to develop the board and rush your opponent down. Even if not rush, then at least put some pressure on him. If he will have to focus on clearing your board and surviving, his own game plan will suffer instead. Corpsetaker is your best bet to win slow matchups aggressively. However, Corpsetaker is the best card to take down slow decks in the early game, as long as you don’t draw Al’akir early. 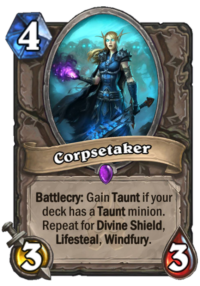 The perfect Corpsetaker will have all of the tags – Taunt, Lifesteal, Divine Shield and Windfury. The Divine Shield and Windfury Part is most useful in slow matchups. Thanks to the Divine Shield, it might be tricky to remove – a single small removal won’t do it. And because of Windfury, it will push twice as much damage every turn (6 damage per turn at base). If you buff it with Earthen Might, that’s 10 damage per turn, which can seal the game very quickly. If you managed to deal some early game damage, try to continue the aggression throughout the mid game. Argent Commander into face is 4 immediate damage and a minion that’s pretty difficult to remove efficiently. Fire Elemental is 3 damage + a big, 6/5 body. Eels can deal extra 2 damage, and Kalimos, Primal Lord can be used for 6 damage. If you get to the late game, you can also combine Al’akir with Earthen Might for immediate 10 damage. Al’akir + Dire Wolf isn’t that bad too, with 8 damage. You obviously don’t have as much burn as Tempo Mage or Mind Blast Priest, but the damage can still add up quite nicely, and dealing ~20 damage even when your opponent removes your board constantly is within the realm of possibility. However, as we all know, aggressive game plans don’t always work. Your opponent might have the right removals, Taunt up, heal etc. Generally, when he stabilizes at a solid life total, there isn’t much you can do. Instead, you have to switch to the value game plan. In this case, Hagatha the Witch is absolutely necessary, without her, you can’t outvalue your opponent. So if you don’t draw her, try to continue with the pressure, at least until you get her. Even though this deck doesn’t pack that much value, Hagatha makes up for it. Since the deck is minion-heavy, it’s very easy to get for example 10 extra spells from her throughout the game, maybe even more if you get her on the curve. While the quality of random Shaman spells is not very consistent (there are great ones and terrible ones), it should still be possible to contest your opponent in the value war. Depending on the matchup, you might want extra removal, extra healing etc. Just play your minions and try to pressure with them, while you get all kinds of extra spells to protect them. In the best case scenario, you might even get enough burn to just close out the game – e.g. 2x Lava Burst is 10 damage out of nowhere. Druid with Spreading Plague is one of your worst enemies. If you don’t manage to kill them early, a massive Plague can turn the game around. If you face Druid, you might want to not press your Hero Power and drop minions instead, especially bigger minions. If you get caught in a big Plague, you can also use that opportunity and drop a free Sea Giant – it won’t help you clear it immediately, but once you do, it will put a lot of pressure on the Druid. Other than Druid, decks with a lot of AoE damage are hard matchups too – e.g. Odd Warrior can clear your board multiple times, and you HAVE to overcommit, because if you don’t, then they will negate all your damage with Hero Power. Control Priest is also a difficult one, mainly thanks to the Duskbreaker and Psychic Scream – the first one can neutralize your early game board and leave a body behind, while the second one clears the entire board while possibly shuffling a bunch of useless stuff into your deck (like Hero Power totems or 1/1 tokens from Primalfin). In those matchups, playing around AoE is important, but don’t get overly cautious – if you play too slowly, worrying about AoE, then you will give them more time to perform their game plan, and leave you without a chance to win. So it’s often worth it to take a risk – if they do have it, then so be it. This specific version of Even Shaman has pretty costly, at almost 11k Dust. It is possible to reduce that cost by a fair bit, but keep in mind that it’s impossible to build a really budget version of this deck. 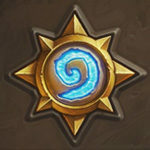 Because of the deck building limitations, basically half of the “potential replacements” are gone, and some of the cards in the list already aren’t optimal – substituting them even further might lead to the deck being unplayable. However, here is a list of Epic & Legendary cards, and I’ll post some potential, budget replacements below. Corpsetaker – Very strong in this build. Since you can get all of its effects, or at least 3 of them quite consistently, the card is great. But it CAN get replaced if you don’t want to craft it. Sea Giant – Technically can be replaced, but I wouldn’t do it – it’s one of the better mid game win conditions this deck has. 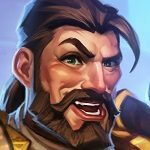 Genn Greymane – The deck is built around it, so there is obviously no way to replace it. Al'Akir the Windlord – Irreplaceable if you want to run Corpsetakers, replaceable if you drop them too. 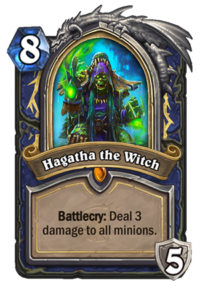 Hagatha the Witch – Hagatha is definitely not necessary, but she lets you win some games you would never win otherwise. If you drop her, try to build the deck more aggressively and capitalize on that aspect instead. 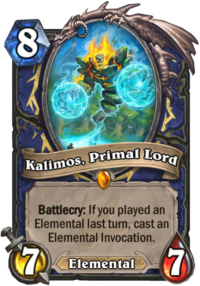 Kalimos, Primal Lord – It’s an amazing card to have in the late game in any matchup, as it serves multiple purposes – AoE, healing, direct damage or board refill. But you could play the deck without it. The Lich King – It doesn’t play a big role in the deck, it’s just a solid, high value late game card. But everyone should have it by now, since it’s been a part of the meta ever since Knights of the Frozen Throne. Second copy of any card this deck runs 1-of – This is always a good point to start. Most of the time, unless it’s a heavy tech card (e.g. Skulking Geist), if you’re missing something, you can use another copy of a card that is one-of in the deck. In this case, second Argent Commander, Hex or Vicious Scalehide. Acidic Swamp Ooze – Good tech card, even though weapons aren’t as popular in the meta as they were before the nerfs, there are still some of them in the meta. Plated Beetle – Okay 2-drop, 2/3 body is nice and extra healing comes handy vs Aggro decks. Stormforged Axe – It’s not an amazing card, but it can help with the early board control, as well as give some extra reach against slower decks later in the game. Defender of Argus – Another way to capitalize on the board floods. You can turn that 0/2 Totems into 1/3 Taunts, which can be quite annoying for some decks to get through. Fire Plume Phoenix – Elemental for the sake of synergies, and an okay 4-drop. 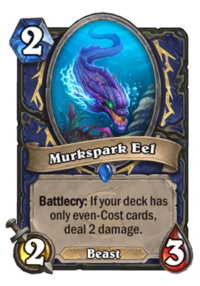 But it just shows how powerful Eel is – you pay 2 extra mana for +1 Attack and Elemental tag. Spellbreaker – I don’t feel that Silence is as useful in this meta, but it can still be good at times. Arcane Dynamo – It’s a very slow card, but playing it will often pay off. With only five Spells that meet the criteria for this Discover in Shaman, you will get Bloodlust quite often (60% of the time), The Storm Bringer is also an interesting choice in this deck, Eureka! 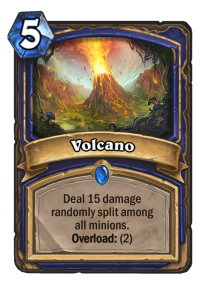 is pretty good in slow matchups if you can isolate a big minion in your hand (especially The Lich King) and Volcano can save your skin against aggressive decks. Lesser Saphire Spellstone is the only bad pick in this deck, since it runs no Overload cards, but you will never be forced to do it. Bonemare – I wouldn’t go as far as putting two copies in, but a single one can come handy. Turning that Totem into a 4/6 minion with Taunt, on top of putting another 5/5 body on the board, can be pretty useful. Which order should I craft them for this deck? Just play a different deck. 3 legendaries is huge to overcome. Also Alakir is essential for your corpsetakers. Hagatha is probably the last craft as she’s just situational for having a shot at a late game win. The number of times she’s actually won me a game is pretty low. Well… I’ve made this deck a few days ago – without Kalimos, but with Hagatha. It did’t really hurt me to not have Kalimos, but Hagatha is a game-winner against control and controlish-midrange decks such as Odd Warrior or Even Warlock. I would definitely craft her first; also, Kalimos goes out in the next rotation. Of course, assuming you 1) cut Corpsetakers, 2) already craft Al’Akir, as he it definitely the one to craft first here. Yes I came to the same conclusion, I crafted Al’akir (with the Corpsetakers). It’s just amazing to be able to do 10 burst in this deck, and the Corpsetakers are icing on the cake. Yes 3 legendaries is a lot but I really like this kind of midrange deck, and I’ve already done the zoo/hunter thing to death. Right now this list looks almost identical to the witchwood’s Even Shaman with the difference that it changes the 2xFire Plume Phoenix for 2xMenacing Nimbus. I’ll check how it goes now..
A lot of the deck lists in Boomsday Project have turned to be very similar to The Witchwood versions, despite getting new cards that were playtested at first. It seems that Boomsday didn’t have enough impact on most of the classes. Well, besides Giggling Inventor, but in that case 35-40% play rate is not a good thing. Yeah, that’s why I’m not sure about Mossy. Most of the decks running it have no problem dropping it. In case of Even Shaman, it clears A LOT of your minions too – it’s great if you get caught in a Plague vs board full of Totems, but it’s nearly unplayable at times, even when your opponent drops Giggling. Great, you clear it, but you also get rid of 3-4 minions on your side, not the best outcome. The deck runs 2 Overload cards, and you’ll get MAYBE another 2 with Arcane Dynamo. What’s the justification for Thunderhead? Am I missing something? At some point i used a similar deck but with 4 overload cards and sometimes it was great (zap! and and the 2mana weapon) However it wasnt very consistent. I think the version without the overload package works better. No Viscious Scalehide or Argent Commander makes Corpsetaker a bit of a bad choice, I’d have thought. If you draw Al’Akir it’s a 4 mana 3/3 taunt at best. She just has insane value now. I can consistently get The Storm Bringer with her as well as a crap-ton of other spells we’re used to getting. I think she’s a must have. Still going at it (14-7 ~11). I have noticed that i’ve been winning a lot before I can even get Hagatha out. Maybe she’s not needed after all. Waiting on the updated guide. Also says fire plume, but the list does not have it. If you read the guide, it says the guide is basically a work in progress after the xpack. It says it includes grumble, but the list iself doesn’t have grumble lol.